The Chinese State Administration of Work Safety completed the investigation into a fatal accident involving a Henan Airlines Embraer 190 jet, killing 44. Investigators cited descent below MDA into fog as the primary cause. On August 24, 2010, Henan Airlines flight 8387 was approaching Yichun Lindu Airport (LDS), China at night following a domestic flight from Harbin. The airplane struck terrain about 900 m short of the runway. A fire erupted. Forty-four occupants were killed and 52 survived the accident. Investigators from the State Administration of Work Safety concluded that the captain, on his first flight into Yichun, continued the approach despite the fact that the reported visibility of 2800 m was below the minimum of 3600 m. Also, the crew continued the approach into radiation fog and without being able to see the runway. The crew failed to initiate a missed approach when the radio altimeter callouts indicated that the airplane was near the ground. A contributing factor to the accident was Henan Airlines’ weak safety management. 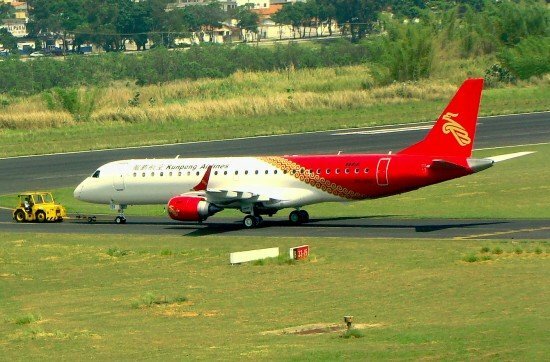 The parent company, Shenzen Airlines failed to supervise the safety management at Henan Airlines. The report concluded that 19 people should be punished. The plane’s captain should be held criminally liable, while officials should be given disciplinary penalties, be demoted or dismissed from their posts.